What’s a development environment? Everyone thinks setting up a development environment needs to be this incredibly arduous process. The installation process could be worse. It’s actually quite simple and this article intends to show you the basics. First and foremost, the GPU is a requirement. Although these algorithms can technically train on a CPU, it could take days in some cases for a single model to converge. It can take a GPU a day or more to converge in some instances. GPUs offer an immense computational power increase over CPUs and are hence a necessity. It’s easy today to find a laptop with a 1,060 or better in it for around \$900. Ubuntu is the typical operating system for this type of development. This article will assume Ubuntu and Bash as the default interaction with the operating system. There are a few common steps that will need to be for each new developer—these steps will be addressed in the following subsections. “CUDA® is a parallel computing platform and programming model developed by NVIDIA for general computing on graphical processing units (GPUs). With CUDA, developers are able to dramatically speed up computing applications by harnessing the power of GPUs.” (Source: https://developer.nvidia.com/cuda-zone). Using CUDA, TensorFlow can achieve drastic speedups in terms of processing power. In order to make this happen, we need to have a certain type of GPU and driver installed on the host machine. So, let’s start installing the things that we require. In this section, a recommended driver will be specified and a few options for installation will be proposed. It’s hard to ensure that the installation will be the same for each developer because the installation can vary for each machine it’s installed on. Instead, we’ll show some methods on how to get it done but will rely on you to figure out the nitty-gritties for their application. You can run the nvidia-smi command to know which version of driver is installed on your system. The output of nvidia-smi will show your GPU any processes you have running and the current driver version installed. What is Docker? According to the Docker website, the keyword for it is lightweight. Docker containers running on a single machine share that machine’s operating system kernel; they start instantly and use less compute and RAM. Images are constructed from filesystem layers and share common files (source: https://www.docker.com/what-container). 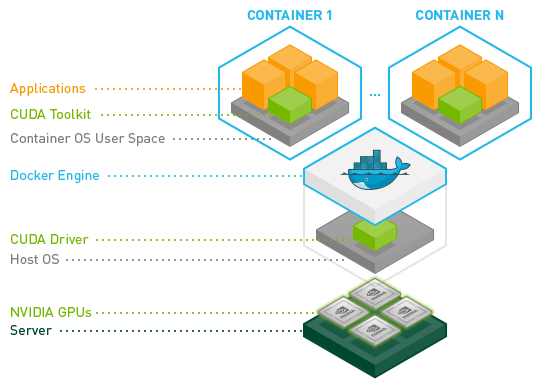 Essentially, Docker allows us to create a lightweight Virtual Machine (VM) in a container where we can house all of our applications and guarantee that the environment is going to be the same every time we enter this container. NVIDIA-Docker goes one step further and provides the appropriate linkage for our Docker containers to be able to interact with a GPU. This is a critical piece for our development environment. Once we have NVIDIA-Docker set up, the rest of the environment is fairly straightforward to integrate. The installation is easy. It’s recommended that you visit the website and ensure that the directions haven’t changed since publication: https://github.com/NVIDIA/nvidia-docker. At this time, NVIDIA-Docker2 is the latest version of development. When you install the NVIDIA-Docker2 system with these steps, it should allow you to upgrade periodically with sudo apt upgrade. Note - The instructions source is found at: https://github.com/NVIDIA/nvidia-docker. Now, let’s go over each of these commands in detail. Here, we’ve completed our step 1 installation! Now we move on to the next step. Now, you’re ready for a simple test of the installation. Now you’re ready to move onto actually building a development environment. What’s a container? A container is Docker’s name for a VM with a certain configuration of operating system and software. Docker containers allow you the flexibility to have a different development environment for every new project with minimal downtime. This is the basics of how you will build a basic image, called base_image. Note - Here are a few topics to cover in case you are curious about how the RUN commands work in Dockerfiles: https://docs.docker.com/engine/reference/run/. If you enjoyed reading this article and are curious about building GANs, you can explore Generative Adversarial Networks Cookbook. With over 100 recipes to build generative models using Python, TensorFlow, and Keras, Generative Adversarial Networks Cookbook is a must-read for data scientists, machine learning developers, and deep learning practitioners looking for a quick reference to tackle challenges and tasks in the GAN domain.